Combina le visite alla Grotta Azzurra e Hvar in un tour di un giorno da Spalato con un motoscafo veloce. 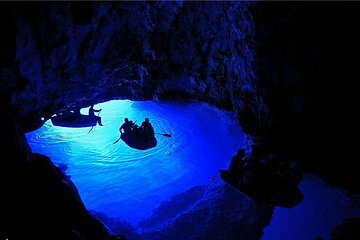 Sull'isola di Bisevo, trasferiti su una piccola barca per entrare nella caverna blu ultraterrena, quindi dirigiti verso Vis per visitare la grotta verde per nuotare e fare snorkeling. Il motoscafo consente l'accesso al remoto Stiniva Beach, quindi alle isole Paklinski e Hvar per un po 'di tempo libero. Usually have a great time on tours booked on Viatour but this one was disappointing. Location was changed 2 days before the trip via email, could have been an issue if I had not checked email. I will say th Blue Cave was amazing and I am glad I saw it. There was not much to see or do in Vis so a waste of time. We then went to a place the tour guide said was the best beach in Croatia. The issue was we just slowed down long enough for guide to tell us that but did not get anytime there. We then went to the Blue Lagoon which was cool. I however was disappointed since the tour description on the clearly states it includes the Blue and Green Caves. However, we only went to the he Blue Cave. I only booked this tour because it included both. We then went to Hvar which is cool but guide recommended and made reservations at a restaurant. The food was not great and the service was super slow. It took almost two hours of our free time. Overall not a great experience.